Since 1975, nearly 250 individuals have performed and studied with Edmonton’s Csárdás Hungarian Folkdance Ensemble, and we welcome every one of these former dancers to our 40th anniversary celebration, together with friends, family, and all those who love Hungarian folkdance and music! 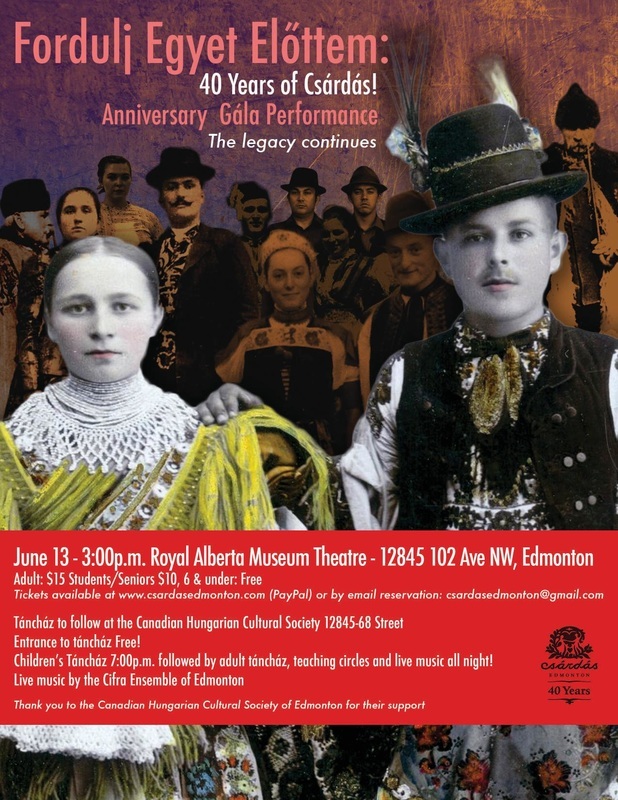 We would like to invite you all to join us for a gala anniversary performance at the Royal Alberta Museum Theatre (12845 – 102 Ave.) at 3 p.m. on Saturday, June 13th. Enjoy a wonderful production, see old friends, catch up on the news, and share the memories! Our 40th anniversary performance features Csárdás, Edmonton’s Cifra Ensemble with live music, and guest artists from Regina, Winnipeg, and Vancouver, in an outstanding Hungarian folk celebration. After the show, head over to the Hungarian Hall (12845 – 68 St.) for food, drinks, and socializing. There’s dancing all night long to live music by Cifra. The children’s táncház runs from 7 pm, followed by adult táncház until the wee hours. Entrance to the reception and táncház is free of charge for all, and the camaraderie and fun are included!